Grilled Honey Barbecue Chicken Foil Packets are the easiest summer meal with practically no clean-up! The perfectly tender chicken is grilled with fresh summer veggies and coated in a delicious sweet and tangy barbecue sauce. Preheat grill to medium-high heat. Cut four 12 x 12 inch squares of heavy duty foil and lay out on a flat surface. Divide the vegetables evenly among the foil packets then nestle one chicken breast in the middle. Drizzle the chicken and vegetables with olive oil and season with seasoned salt and pepper to taste. In a bowl, whisk together the barbecue sauce, honey, apple cider, paprika and chili powder. Brush sauce on both sides of the chicken - reserving enough for later. Sprinkle with half of the chopped parsley. Lift the sides of the foil over the chicken and seal to close off the packets. 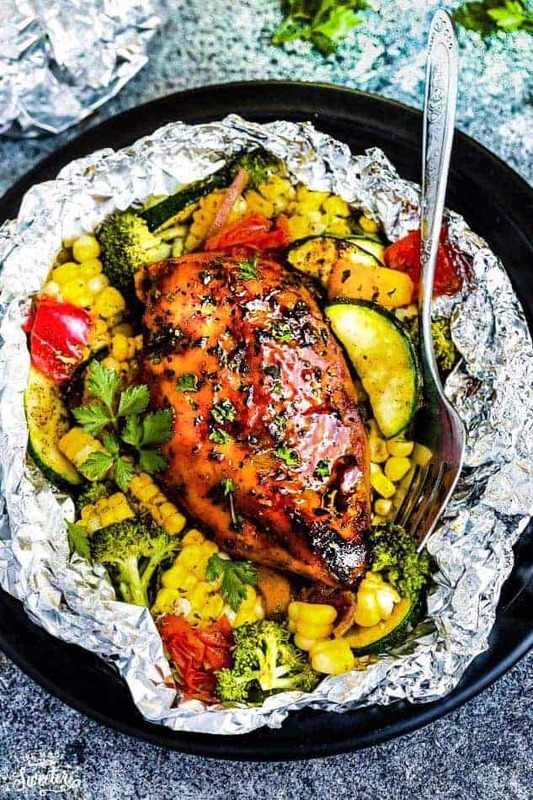 Place foil packets onto grill and grill for 7-8 minutes, then flip over and grill for an additional 7-9 minutes (depending on the thickness of the chicken), or until chicken is cooked through. Remove from the grill and carefully open the foil packets. Brush chicken with reserved sauce and top with fresh parsley and serve immediately.